Reporters Without Borders (better known under its French acronym RSF) published its WORLD PRESS FREEDOM INDEX 2018. The rankings you can find by clicking here READ MORE. The regional chapters below give a quick overview of the main trends, including the disturbing downward turn in the USA, the further sinking in ex-sovjet states and China’s nefarious example in Asia. North Africa’s performance in the 2018 World Press Freedom Index reflects the different pressures to which journalists are exposed. Restrictive laws, reporting problems (especially at protests), and subjects that are off limits all prevent journalists from being free to provide independently reported and pluralist news and information. Despite having strong constitutional protections to the contrary, the latest World Press Freedom Index findings on the US and Canada reveal two countries whose journalists and media workers face constant challenges to the very freedom to exercise their profession. The 2018 Index shows a slight overall improvement in respect for press freedom in Latin America but this should not divert attention from the continuing problems of violence, impunity, and authoritarian policies towards journalists in many Latin American countries. The Chinese model of state-controlled news and information is being copied in other Asian countries, especially Vietnam and Cambodia. North Asia’s democracies are struggling to establish themselves as alternative models. Violence against journalists is increasingly worrying in Afghanistan, India, Pakistan and the Philippines. SUB-SAHARAN AFRICA HAS MAINTAINED ITS THIRD PLACE IN THE RANKING BY GEOGRAPHICAL REGION, WITH A SLIGHTLY BETTER OVERALL INDICATOR THAN IN 2017. BUT THERE IS A WIDE RANGE OF SITUATIONS WITHIN THE REGION, AND JOURNALISTS ARE OFTEN THE VICTIMS OF INTIMIDATION, PHYSICAL VIOLENCE, AND ARREST. THE FORMER SOVIET COUNTRIES AND TURKEY CONTINUE TO BE AT THE FOREFRONT OF THE WORLDWIDE DECLINE IN PRESS FREEDOM. ALMOST TWO-THIRDS OF THE REGION’S COUNTRIES ARE RANKED SOMEWHERE NEAR OR BELOW THE 150TH POSITION IN THE INDEX. THE REGION’S OVERALL INDICATOR HAS SUNK ALMOST AS LOW AS THAT OF MIDDLE EAST/NORTH AFRICA, THE REGION THAT IS LAST IN THE RANKING BY REGION. The European model’s erosion, a trend visible in RSF’s most recent Indexes, has continued in the 2018 Index. The region has been shaken by two murders, as well as by threats to investigative reporters and unprecedented verbal attacks on the media. Even the countries at the top of the Index are affected by this alarming climate. The Middle East’s countries are yet again at the bottom of RSF’s World Press Freedom Index. Armed conflicts, terrorism charges against independent journalists and media, and growing online surveillance and censorship make reporting extremely dangerous for the region’s journalists. Killings of environmental human rights defenders up again compared to last year! Soy field in the Brazilian Amazon. Photo by: Rhett A. Butler. The assassination, murder, and extrajudicial killing of environmental activists rose by 20 percent last year, according to a new grim report by Global Witness. 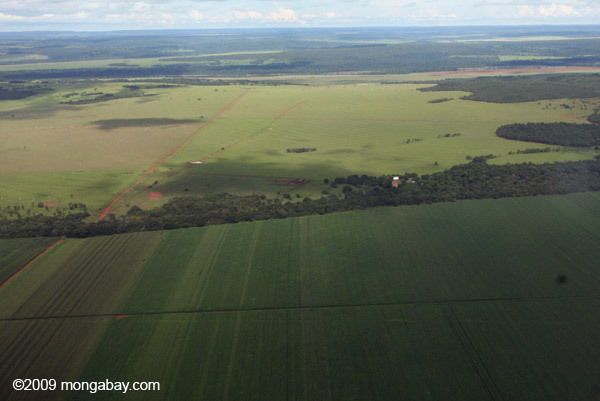 The organization documented 116 killings in 2014 across 17 countries with the highest number in Brazil, which saw 29 environmental and land defenders killed. Still, the report is a major understatement of the problem as data across much of Africa, China, the Middle East, and Central Asia remains scarce to non-existent. Most of the deaths last year—116 of them—were related to disputes over land. But mining was linked to 25 deaths, and hydroelectric dams and agribusiness to 14 each. Indigenous people also remain among the most targeted. “In 2014, 47 indigenous people were killed defending their natural resources, 40 percent of the total deaths of environmental and land defenders,” reads Global Witness’s new report, entitled How Many More?. This year’s report follows a landmark document last year that tracked environmental activist killing—all 908 of them—over a dozen years. 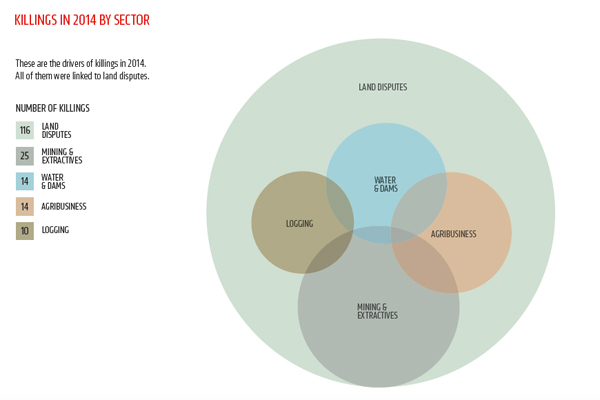 Environmental activist killings by sector. Image courtesy of Global Witness. Human rights defenders are stigmatized (as ‘anti-development’) and criminalized in order to silence their opposition. While Brazil had the highest number of environmental activist murders in 2014, the most dangerous place to be an environmental activist was actually Honduras, according to Global Witness. During the last five years (2010-2014), Honduras lost 101 activists, giving it the highest rate of environmental activist killings per capita. 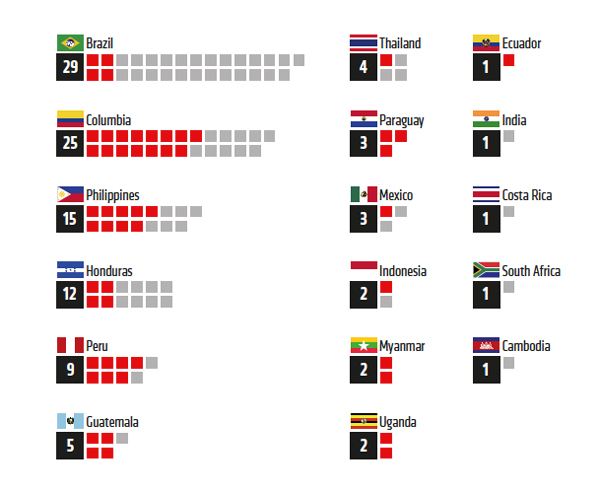 Environmental activist killings by country. Those in red were indigenous people. Image courtesy of Global Witness. Killings of environmental activists jumped by 20 percent last year. Reporters Without Borders recently published its 2014 World Press Freedom Index. It has a nice easy-to-use and colorful map. The accompanying text spotlights the negative correlation between freedom of information and conflicts, both open conflicts and undeclared ones. In an unstable environment, the media become strategic goals and targets for groups or individuals whose attempts to control news and information. The ranking of some countries has also been affected by a tendency to interpret national security needs in an overly broad and abusive manner to the detriment of the right to inform and be informed. This trend constitutes a growing threat worldwide and is even endangering freedom of information in countries regarded as democracies. Finland tops the index for the fourth year running, closely followed by Netherlands and Norway, like last year. At the other end of the index, the last three positions are again held by Turkmenistan, North Korea and Eritrea, three countries where freedom of information is non-existent. Despite occasional turbulence in the past year, these countries continue to be news and information black holes and living hells for the journalists who inhabit them. This year’s index covers 180 countries. On Wednesday 14 January, Front Line Defenders launched its 2015 Annual Report, “Human Rights Defenders, Lives in the Balance” which examines in detail the deteriorating situation for human rights defenders (HRDs) around the world in the period January – December 2014. The report was launched at a press conference in Dublin with as keynote speaker Mary Akrami, Co-founder and Director of the Afghan Women Skills Development Centre which was the first safe house for women and children in Afghanistan. Mary Akrami, Andrea Rocca, and Mary Lawlor from Front Line Defenders launch the report. Over the last two years Front Line Defenders has documented a growing global backlash against human rights defenders (HRDs) which has now reached crisis point. Against this backdrop, international human rights institutions as well as governments traditionally supportive of human rights defenders appear to be incapable of forcefully and effectively opposing the shutting down of civil society space. “This is a crucial political moment. If we are to challenge the systematic erosion of human rights standards there needs to be a more consistent and credible political response, which must give the same priority and resources to creating a safe space for HRDs as authoritarian governments give to closing it down” said Front Line Defenders Executive Director, Mary Lawlor. “There can be no human rights progress if those at the forefront of human rights work are not allowed to work”. • HRDs are exposed to digital attacks. True Heroes Films – Latest News. Human Rights Watch World Report 2014 (covering 2013) was released on 21 January 2014 with press releases and – to illustrate the growing importance of images – with a press conference streamed live from Berlin. Speakers are Kenneth Roth, Executive Director of Human Rights Watch, and Wenzel Michalski, Germany Director of Human Rights Watch. Protection International (PI) is published on 23 February 2013 its first FOCUS report. To commemorate the 15th Anniversary of the UN Declaration on Human Rights Defenders (HRDs), the report presents the results from PI’s research on public government policies to protect human rights defenders internationally. It analyzes the development of public policy meant to protect human rights defenders. While acknowledging advances that have clearly enhanced existing regional and international mechanisms, the report adopts a critical approach since States are ultimately responsible for protecting Human Rights Defenders, starting with governments.PI hopes this report will contribute to the discussion on how to improve existing public policies and spur discussion between civil society organizations and governments of countries where protection of human rights defenders is far from being ensured. The full report can be downloaded in several languages via: FOCUS Report 2013 : “Public Policies for the Protection of Human Rights Defenders: The State of the Art” | | ProtectionlineProtectionline.